Can you talk a bit about your path to UC Irvine and decision to study informatics? When I was applying to colleges during my senior year of high school, the only UC I applied to was UCI because of its informatics program. My decision to study informatics stemmed from a summer camp I attended in high school, where I had the opportunity to visit companies in Silicon Valley. I loved learning about the companies’ creative, innovative environments and the projects they were working on. From that moment, I knew I wanted to be in the technology field, especially when I found out that not a lot of women are in the field. I wanted to be someone who could inspire future generations of females to pursue STEM fields. Informatics in particular appealed to me, because I wanted to work with people and technology. The user experience is a crucial part of designing a technological product, and I wanted to be a part of that process. Have you had a favorite class at UCI? My favorite class at UCI was Informatics 132: Projects in Human-Computer Interaction. This class gave me clearer insight into what I see myself doing with my degree. My team and I did a mock redesign of the Anteater Express, and it was great going through the whole design process. We learned how to interview people and conduct surveys to gain the user’s perspective. We also learned how to do storyboards, wireframes, mockups and more. I had wonderful team members, who became some of my good friends in the School of ICS. What activities have you been involved with in at UCI? I have been involved with UCI Student Housing for three years. I was a Middle Earth attendant for my first two years at UCI. Now, I am a Middle Earth resident advisor for the special interest hall focused on “Performing Arts/Fine Arts and Music.” In addition, through Women in Information and Computer Sciences (WICS), I was able to volunteer at a local high school and teach girls how to code, and I have been a lector, Eucharistic minister and CORE leader with the University Catholic Community at UCI for four years. I also currently work as an ICS Study Abroad peer mentor, encouraging ICS students to study abroad and helping them plan their experiences. You spent a semester at the University of Manchester. How was that experience? There are many benefits to studying abroad. I gained a new perspective about the world around me. I got the opportunity to travel to seven different countries. I made friends from all over the world, and I am still in touch with them today. I experienced U.K. culture and lived life as a British student. I learned how efficient public transportation is in other countries. Most of all, I had the best three-and-a-half months of my life, and it ended up being the best part of my college experience. One of my favorite memories from my time in Manchester happened in October 2016. My friend from the UC Education Abroad Program (UCEAP) and I were there when the Duke and Duchess of Cambridge stopped at the National Football Museum. After their visit, they came outside and started greeting everyone along the barrier. The Duchess of Cambridge came up to me first and shook my hand. I told her that we came all the way from the United States to see her. It caught her attention and she started asking me questions about what I was doing in Manchester. Then, the Duke of Cambridge came up and shook my hand. He seemed pretty excited to talk to me and was interested in getting to know me just like Kate! He even asked me which football team I supported! For more information, including photos and a video, see Deleon’s related UCEAP blog post. The best part is the people I have met. Although I have had so many great experiences at UCI, it’s the people who have made the experiences so memorable. Getting involved on campus helped me make so many friends, and these relationships enriched my whole college experience. If you are trying to figure out which college to attend, visit the campus! When I stepped onto UCI’s campus, I had this feeling that overcame me, and I knew I was meant to be here. I felt a sense of comfort and excitement at the thought of walking on campus every day. Find that feeling and trust it, because it helped me make one of the best decisions of my life. 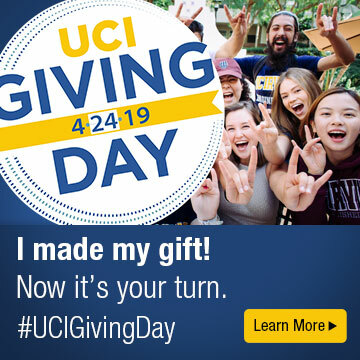 I was able to figure out why UCI was the place for me by going on the campus tour, attending ICS information sessions, and interacting with the students and faculty during Celebrate UCI. I recently accepted a job offer from Disney at the Glendale campus. I will be working on enhancing the user experience of the Disneyland Parks and Resorts mobile app. After working for a few years, hopefully I can go back to school for an MBA, but for now, I am excited to have a job after graduation. I can’t wait for the new experience!